For those looking for a relaxing movie to help get their weekend started I present to you Frontline's 20 minute documentary on the recent collapse of MF Global and their $6 billion bet that went very wrong. 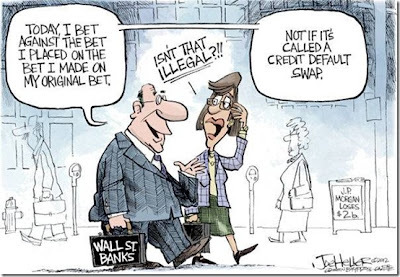 After JP Morgan recently reported a $2 billion trading loss in the derivatives market (estimates show that number rising), it is important to understand that banks today continue to take enormous trading risks with massive leverage that are now fully backstopped with tax payer money. Heads the banks win and bonuses soar; tails the tax payer handles the losses. Marc Faber spoke with CNBC this week to discuss his thoughts on the European debt crisis. 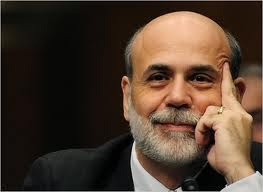 He believes there is 100% certainty the global economy will be back in recession by late 2012 early 2013. He likes US dollars (safe cash) as an investment to protect yourself during that downturn, and he believes the gold correction may have further to run; specifically if it breaks below the December 2011 lows of $1522. Things appear to be escalating in the Eurozone crisis, which has now turned into a full fledged bank crisis. While we have walked through the steps of the policy responses from political and monetary leaders numerous times, let's take a moment to walk through the process from the eyes of a citizen on the ground. Imagine that you are an average citizen living in Greece. You have a family with two children and by now it is very likely that you have heard the news of a bank run. You are beginning to understand the ramifications of Greece moving back to the drachma currency after it leaves the Eurozone (an immediate and massive devaluation that would destroy 60-70% of your wealth). Up until this point, Greek citizens have responded by moving their money into Germany. James Turk wrote an interesting article this week discussing how safe this money actually was now that it was in German hands. 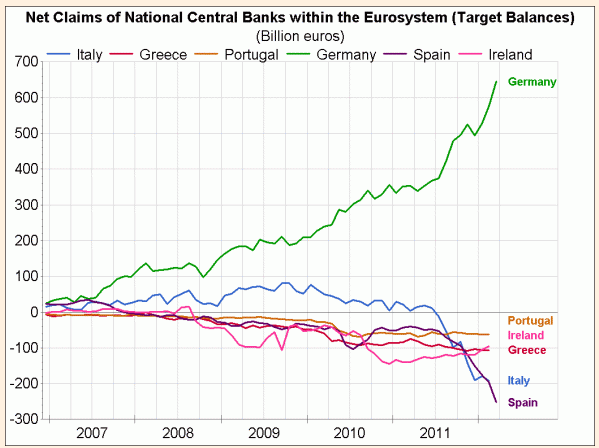 Each country within the Eurozone has its own central bank that allows tracking of cross border money movement. A bank in Germany can see exactly where the money has come from when a new account is opened. Should Greece be removed from the euro, both Germany and Greece can agree to convert these newly opened accounts into drachmas as well. These "speculators" will be branded as the people that caused the bank run. This means that while Greek citizens have smartly moved their money early, they may find out in the end that they were not protected after all. There is a second option - which is to remove your euros from the bank and put them under your mattress. There is obvious danger in this strategy as well in the form of theft. People are beginning to starve in Greece as the austerity sets in and the depression deepens. When people get hungry, they will come for your cash. "Many people have withdrawn their money from the banks fearing a financial crash, and they either carry it on them, or find a hideout at home or in storage rooms. We urge people to trust the banking system, leave their money there, or at least in a safe place, not at home." The statement was made to both keep people safe and "scare" people into leaving their money at the bank, but the people know that leaving it there will mean that 60% or more will be stolen through devaluation. So is there another option? Yes. They could convert their cash into precious metals. There are two ways to do this. The first would be to find a local coin dealer and trade cash for coins. This strategy creates the same situation they were in above where their precious metals would be available for theft. Another strategy, the one that I believe is most effective, would be to electronically convert their cash into precious metals through a facility that stores the metal for them - specifically an entity outside their country. For example, a customer could open a Goldmoney account and electronically purchase and store metals in vaults around the world. They could call Sprott Asset Management and discuss moving money into either the PSLV (silver) or the PHYS (gold) funds. They could do the same through the Central Fund of Canada buying into a fund such as the CEF (both gold and silver). Does this create the same risk as moving money electronically into Germany? Yes, but not on the same level. This money will be much tougher for the governments to track because there are not two central banks working together. They would have to approach each individual company or government fund separately and ask to see their records. Many, or all, of these entities would most likely tell the central banks to go F themselves. This is how I see precious metals becoming an attractive investment even if we face a deflationary crash (total money supply and credit contract), which can only occur through a banking crisis. 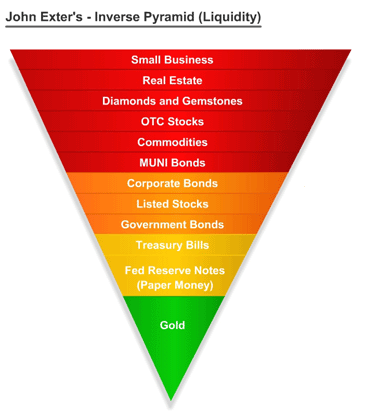 The following chart known as "Exter's Pyramid" shows the various investment options an investor can use to store their wealth ranked by liquidity. This means if there is a panic rush for money, how quickly you can convert it into liquid spending power. You'll notice that the base of the triangle is composed of precious metals. If the financial system were to collapse on itself, then the paper contract structure would collapse downward on itself as well. 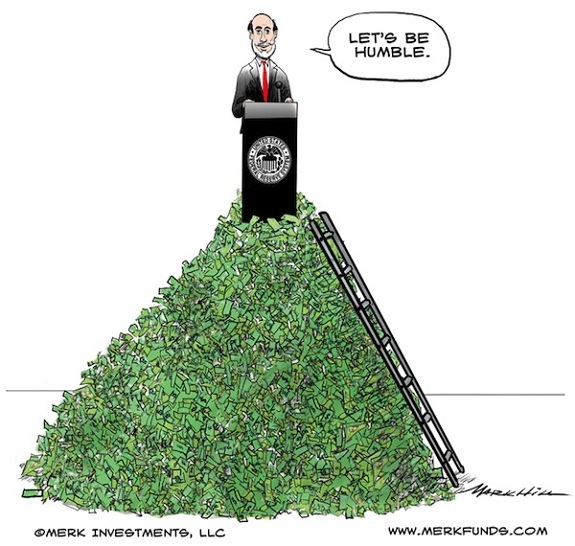 There would be a rush to the liquidity found at the bottom of the pyramid. In the final section of my 2012 Outlook (see below for link), I said to focus on safe cash (the yellow in the pyramid above) and precious metals (the green in the pyramid above). Federal reserve notes (paper money) held at the bank are not the same as federal reserve notes held at your home. If you have cash sitting in a savings account you are loaning that money to the bank. You now rely on them to pay you back, known as "counter-party risk." It is up to both the FDIC (has no money) and the federal government to back stop that bank. 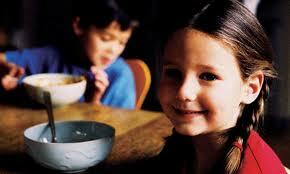 See article below for a much more in depth discussion on this topic. Now extrapolate this thought process through for the citizens of Portugal, Spain, Ireland, and Italy. Then move forward to Japan and the UK. Then the United States. How many people living in those countries will look at what is taking place in Greece and do some research on their own bank accounts? Those that do will find out that their savings accounts are being lent into an insolvent banking system backed by an insolvent government. What percentage of the hundreds of trillions of dollars in paper currency assets needs to move into precious metals (only a spec of dust in size in the physical market) to make the price move? Will things get so out of control to the point where a conversation like this has relevance? We'll find out soon. The goal here, as always, is to project forward and look at the world through a possible future. If you can visualize and walk around in that possible reality you can better prepare yourself for it today. How do I think it will play out? I think Greece will be forced to exit the euro and we will face another Lehman type moment where asset prices plunge. You will then see central banks and governments step in with "shock and awe" liquidity (money printing) to try and save what is left. This is exactly how it played out in 2008. As I have been recommending for over two years now, I would have safe liquid cash available during a coming buying opportunity, and I would have insurance in place through precious metals. When everyone is panicking, you want to have the courage (and available capital) to step in and buy. In the meantime, all you need is patience. For more on the safety of bank accounts see: What Backstops American Savings Accounts? I am a huge fan of AMC's Mad Men (possibly the best show on television today). With each season, I find myself paying closer attention to how ads are created and thinking about the work that was put into designing them. The following infographic takes a look back at the best ad campaigns in history. For those that do not watch the show, the following clip is a preview of Don Draper, the star of Mad Men, selling a new client on a campaign. Housing Showdown: Bottom Or More Room To Fall? Most readers here know my thoughts on the near term direction of home prices (see 2012 Outlook: Residential Real Estate), but it is always good to hear the opinion of other financial professionals. The following Bloomberg discussion pits the bull vs. the bear. The bull's argument is that real estate prices have already fallen 35% so "it can't get much worse....right?" It echos the pronouncements from stock market bulls back in 2000 arguing that the NASDAQ was a buy after it fell 35%. The unfortunate ending for those buying that "discount" was that the NASDAQ ended up falling 80% before finding a bottom. Gary Shilling's (the bear's) argument is based on facts and inventory data, which makes all the homeowners on the set squirm with discomfort thinking about their piece of the American dream sitting at home waiting for them. Most likely underwater. It is always interesting to hear Nigel Farage, who has a background in finance, speak to and answer questions from the European politicians who have a background in.....politics. While Nigel understates how devastating it will be for Greece to leave the euro in the short term (bank runs, food and energy shortages, import prices rising) he does an excellent job of explaining that it is the only option in the long run. The longer they wait the more difficult the short term pain will be. If Greece removed itself from the euro and allowed their new currency to float downward (it would probably depreciate close to 60% or more as Nigel discusses), and they allowed their bad banks to liquidate through organized bankruptcy (protecting savings accounts) with new and strong banks emerging with clean balance sheets, what kind of person would possibly keep their money in Greece? And I would not be alone. Just as the smart money has already left Greece in preparation for the coming devaluation, the smart money would be the first to re-enter after the devaluation took place. New capital would enter the country to purchase the assets at distressed prices and businesses would immediately open up within the borders of Greece to take advantage of the export advantages created by the lower currency. This new production of goods would eventually lower the cost of living within the Greek borders, and it would set off an economic boom. It would just take time. In the long run (3-5 years) Greece could be one of the strongest economies in Europe. They just need a politician who is willing to be honest with the people. Who knows, if that were to happen Greece may even be an attractive moving destination for someone like myself who is business minded and looking for a place to raise a family. While I certainly don't agree with or believe everything found in the following video there is a lot of excellent information; specifically regarding how the corporate-political structure has been formed over the years. The goal in sharing it on this site, as with everything found here, is to push your mind beyond the basic media headlines provided elsewhere. For those out that there still want more, I present to you the Harvard Business School case study created on Kyle Bass and his "outside the box" view of the future for Japan's debt markets. Yes, the same Kyle Bass who had an "outside the box" view of subprime bonds back in 2006 and bet against them through credit default swaps, which led to him being the star character in Michael Lewis' book "The Big Short." The same Kyle Bass who, after the financial crisis hit in 2008, took his billions in profits and began betting against a very small country named Greece; two years before Greece ever reached a headline. He is now positioned with heavy firepower against the Japanese debt markets, and he is most likely once again very early on the trade. Click on the full screen button for a larger view. For those that enjoy listening over reading, the following is a recent (and rare) interview Kyle Bass gave to BBC News. The Stock Market: Where Do We Go From Here? Stocks have now moved significantly lower from the recent highs bringing back some concern from market participants. 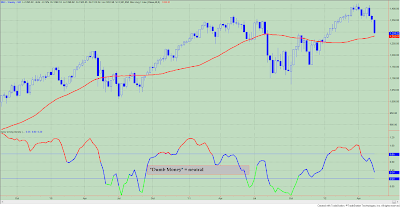 The market is oversold in the short term and due for a bounce, but where are we in the long term? To look out in the years ahead we must review our understanding of secular cycles. We are currently in a secular bear market cycle that, based on history, will probably last close to 17.6 years. For an understanding of where I get this number please see Historical Guides: Stock Market Cycles & Public Ownership. This means we have close to 5 years remaining in the current bear market. The following chart helps visualize the bottoming process that will take place as we move forward. It shows the DOW from 1885 through today with the blue line running through the center providing the long term "trend line." The DOW would need to fall back to 7,636 on Monday morning in order to get back to the historical trend. This obviously will not happen on Monday, but it provides an understanding of where we may be headed moving forward. A secular bear market throughout history has moved significantly below the trend line in order to find a bottom. This process cleanses the market of all weak hands and brings the price to earnings (P/E) ratios down to levels that create undervaluation. The market only touched the long term trend line at its lows in March of 2009. It did not move below. That is the long term. Most people are concerned about where we are heading next week, which I of course, have no idea. However, to get a better gauge of the short term movements within a longer term secular cycle you must follow sentiment indicators. When market participants are more optimistic about the future direction of prices the index moves up. When they are more pessimistic the index moves down. Historically these four groups have been on the wrong side of the trade. This means when they are optimistic you should be very fearful. During most of 2012 the line moved upward into the bullish category (the bottom line turned red flashing danger). During this current decline it has fallen significantly and is now in the neutral camp (line has turned blue). 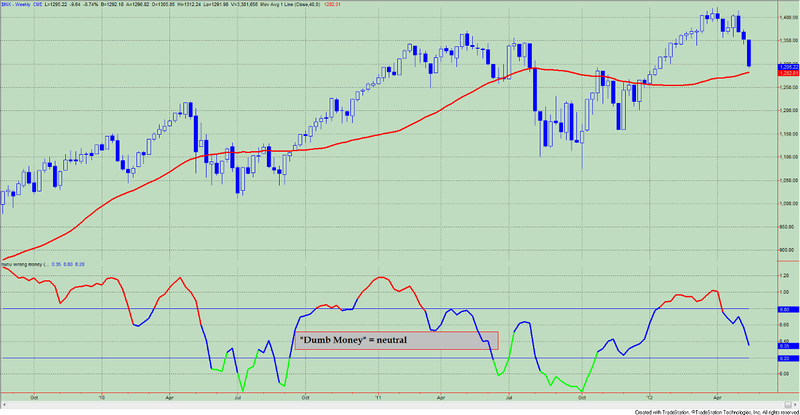 When it turns green it means that they are pessimistic creating the opportunity for a short term bounce in the market. For a more detailed discussion on the important of sentiment see 2012 Real Estate Outlook: The Fall (2006 - 2011). The author of the international best seller "The Black Swan" spoke with BBC this week regarding the risks in the financial markets. What Backstops American Savings Accounts? There is an article in The Telegraph this morning titled: "Spain reeling over financial fears: 'Will my money be safe?' ask customers in Madrid banks." This bring up an interesting thought experiment. The citizens of Spain that connect the dots now understand that the Spanish banks are currently underwater; meaning their toxic real estate portfolio losses if marked to market exceed their reserves and deposits. They have been kept alive with liquidity injections from the European Central Bank and a quasi government backing. Last week one of the largest banks in the country, Bankia, was nationalized instantly when it ran into trouble; similar to Fannie and Freddie in the United States back in the summer of 2008. The government now stands behind both the deposits and the toxic assets. They do this to create confidence, which is the model our entire financial system is based on. However, it is not difficult for a Spanish citizen to figure out that the government that is backstopping their deposits is now being called into question on its ability to finance operations in the debt markets. If the government cannot raise money in the debt markets, who stands behind the average citizens deposits at the bank? The people of the United States watch this taking place on their television sets and are appreciative that they have no such worries in their country. 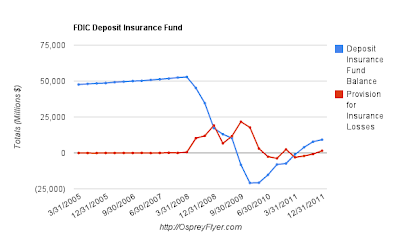 American savings deposits are backed by something called FDIC insurance up to $250,000. This means if you have $250,000 in a savings deposit at the bank you have "nothing to worry about." If the bank should ever fail the FDIC will immediately arrive and backstop your savings. 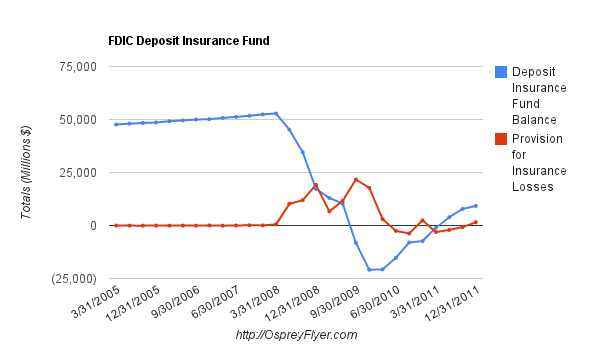 How much money does the FDIC have available to backstop the deposits? In the following chart the blue line shows this number, which was a consistent $50 billion leading into the financial crisis. They get this money by charging all banks an annual fee for the insurance. It is like a big savings account. In 2008, as banks begin to fail rapidly, this money was quickly used up and the FDIC went into the negative for 7 straight quarters. This means they have to borrow from the federal government in order to stay alive. The FDIC today has just over $9 billion available to backstop America's deposits. With this $9 billion, what is the size of the total deposit base they are in charge of protecting? Think about that for a moment. If just a small amount of Americans felt that their money was not safe (see the headline above in Spain) they would enter the bank and begin pulling deposits. The FDIC would be out of business in about 15 minutes. What stands behind the FDIC? The federal government. Ah, good. But wait a minute, doesn't the American government rely on borrowing every month just like Spain in order to pay its bills? If there was a run on the banks in America the savings accounts are only backstopped by the federal government's ability to enter the debt markets and borrow $5 trillion. In a world where governments are are already loaded with debt and face problems of their own where would America find a buyer for this debt? We come to the final answer. The savings accounts of America are not backstopped by the FDIC or the federal government, which are both insolvent entities, they are backstopped by the Federal Reserve. A printing press. This type of thought experiment is something that 99.9% of people (fortunately) never walk through. For a system based on confidence, ignorance is bliss. 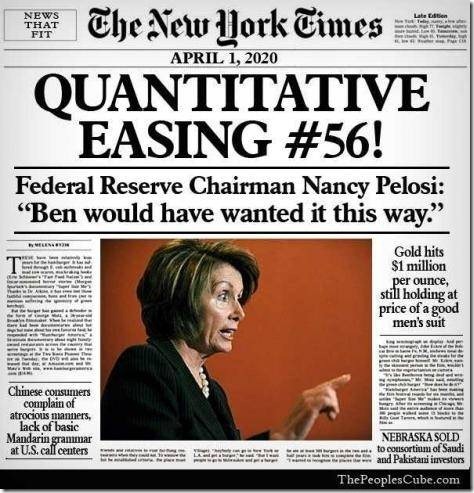 I personally hold my savings in the form of physical precious metals which have no counter party risk; meaning they do not rely on some other entity's ability to pay. Today I am considered very strange for doing so, but I would imagine more and more people in a country like Spain or Greece (or any country with insolvent banks backed by an insolvent government - see Portugal, Ireland, Japan, or the UK to name a few) have come to the same conclusion as I have. If you would like to store a portion of your wealth in physical precious metals that can be moved electronically like a bank account, the company I use and recommend is called Goldmoney. You can set up an account in just a few minutes by following the link below. The time to purchase insurance is not after the building has caught on fire as the people of Spain will soon find out. For more on the speed which deposits are leaving troubled European countries see: Modern Day Bank Run In Europe.